Oh, yes, we're going to be beating the Thor Equities/Coney Island drum very, very loudly on this Tuesday. What else can we do when there is so much Coney Island news to share? 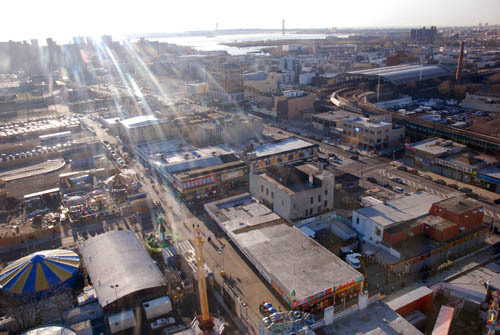 In any case, Thor will doing "a presentation on its vision for the future of Coney Island" on Tuesday (6/26). It will take place at 7PM at United Community Baptist Church, which is located at 2701 Mermaid Avenue. Thor calls it a "Town Hall" meeting and says that it "will be a great opportunity for everyone interested to get a first-hand look at the wonderful things Thor has planned for Coney Island, and you are all encouraged to come out and let your voices be heard." We wouldn't be surprised, at this point, if developer Joe Sitt himself were to show up to try to make a pitch for his project.